The Potenza RE910 with UNI-T is designed to deliver outstanding wet performance, especially wet handling, while still providing excellent dry performance. It is available in a wide variety of sizes to fit domestic and imported performance vehicles. 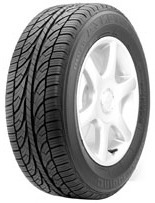 The Potenza RE910 tread pattern is derived from Formula One Potenza racing rain tire technology. Formula One, the pinnacle of auto racing, is a showcase of the world's leading auto technologies presents the ultimate test of Bndgestone advanced technology.